Our plant hire specialists are always up for a challenge – and we pride ourselves on being able to get hold of the right equipment for any job. That determination was put to the test when we were called upon by Mildren Construction, one of Selwood’s largest and longest-established customers, to help with a particularly tricky problem. Mildren had been awarded a high-profile job to improve flood defences in the Hampshire village of Hambledon, where homes and businesses have repeatedly suffered water damage in recent years. Mildren had been using a Hyundai 14t excavator at the beginning of the job but it soon became clear that it would be better to use a zero tail version that was not in the Selwood fleet at that time. 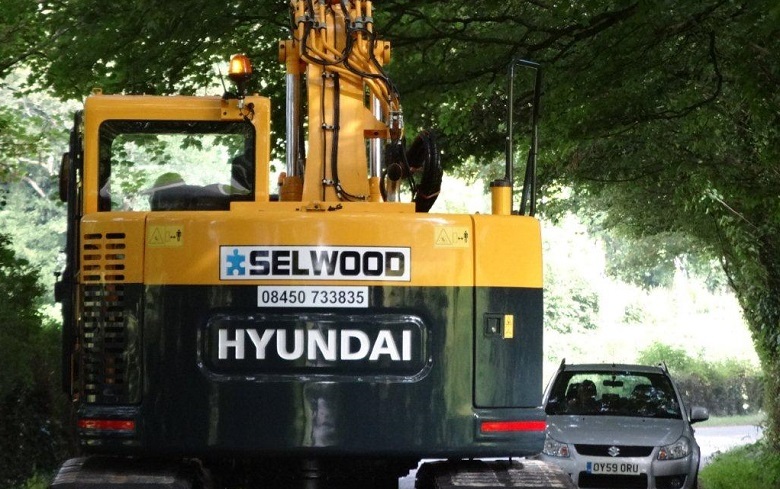 With the help of Selwood’s plant sales specialists, a Hyundai R145LCR-9A machine was found. Hyundai had shipped the excavator in to sell to another company which had then decided not to buy the machine. Selwood’s sales department secured the equipment and it was delivered to our Head Office to be brought up to specification. It was fitted with rubber pads so that Mildren could use it along the side of the highway without causing damage. Mildren Construction’s site team were delighted with the equipment and with the efficiency, knowledge and resourcefulness of Selwood’s plant hire team.